ISLAMABAD: As the results of July 25 polls were released by the Election Commission of Pakistan (ECP), it was revealed that 4,674,545 votes were cast in favour of members of religious parties who contested for National Assembly seats across the country. Representatives of religious parties received the highest number of votes from Punjab where they bagged a total of 1,859,198 votes from NA-55 to NA-195 constituencies. The second highest votes in favour of candidates of religious parties were cast in Khyber Pakhtunkhwa. A total 1,347,367 votes were cast for leaders of various religious parties in NA-1 to NA-51. Meanwhile, in Sindh, 1,124,047 votes and in Balochistan 304,129 votes were cast in favour of religious party candidates from NA seats of NA-196 to NA-256 and NA-257 to NA-272 respectively. Further, during the July 25 polls, religious party representatives received a total 39,804 votes from three Islamabad constituencies — NA-52, NA-53 and NA-54. 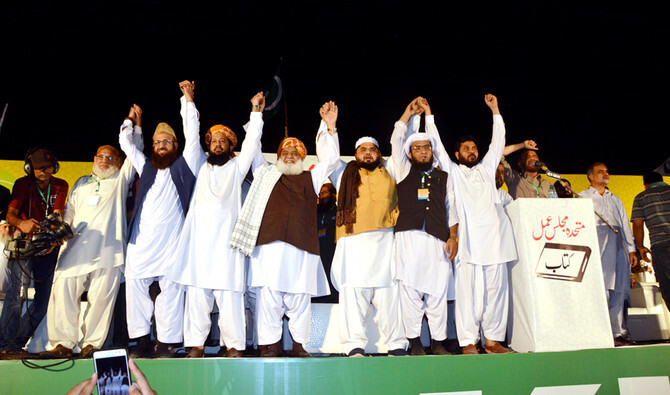 The Muttahida Majlis-e-Amal, an alliance of religious political parties, secured 12 National Assembly seats in the July 25 polls.